Contrary to qualifying, the sun is out for the start of the Malaysian Grand Prix, heating the track to 47°C at an ambient temperature of 35°C. 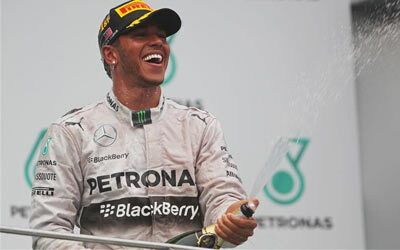 As the lights went out, Lewis Hamilton made a clean start from pole and managed to easily retain his first place. Behind him however, Rosberg had a great start as well and saw Vettel turn into him. The Mercedes driver got the edge nonetheless while Daniel Ricciardo managed to get into this fight and emerge from the first corner in third place, ahead of his teammate Vettel. Behind them is Alonso, followed by Hulkenberg and Raikkonen. The latter though soon got rear-ended by Magnussen, causing a flat rear tyre that relegated him to the back of the pack. The problem occurred on turn 3, so the Finn had to complete nearly the entire lap before coming into the pits for a new set of tyres. Meanwhile in the back, Bianchi hit Maldonado in turn 5, triggering a 5 seconds stop and go penalty for the Marussia driver. Maldonado was told to abandon the race on lap 7 already, but still that's better than Sergio Pérez whose Force India had a hydraulic issue and didn't even make it to the starting grid. On lap 10, Magnussen is the first of the runners to pit. The team have probably moved his stop forward to be able to change the front wing as soon as possible. That left front endplate was fairly badly damaged. Seconds after emerging from that stop, Magnussen was also handed a first second stop and go for that incident with Raikkonen. On lap 12 Alonso pitted for a new set of mediums, followed by Ricciardo one lap later. The two found each other in the first corner as Ricciardo exited, and Ricciardo got the upper hand eventually after a close fight through turns 2 and 3. Vettel pitted on the next lap and rejoined the track only just ahead of his team mate. The Bulls, along with Alonso were then slightly held up by Bottas who was struggling on his tyres, but half a lap later they were all past the Williams. 2 laps later Rosberg pitted, followed by HAmilton one lap later. Both Mercedes drivers also stayed on the mediums, with Hamilton still comfortably ahead of Rosberg. On lap 20, Vergne entered the pits and is out of the race. He was running at the very back of the field following a very bad start that saw him drop in between the Caterhams. One minute earlier, Raikkonen had passed the Toro Rosso followed by a pitstop for the Finn, changing from medium to hard Pirelli tyres. Halfway into the race, Hamilton still leads, 10 seconds ahead of Rosberg. Vettel is 3.5 seconds down and Ricciardo another 6 seconds. Alonso was about 5 seconds down on the second Red Bull but the Ferrari driver then pitted. Hulkenberg who had been closing into Alonso rapidly therefore inherited 5th place. By lap 34, all top 4 runners have pitted with only Ricciardo having changed to the harder tyre. Vettel appeared to have gained most in the stops as he is less than a second behind Rosberg. One lap later Sutil parks his car at the start of the pit straight, nicely on the inside of the circuit, far away from the racing line. Another lap later Gutierrez is unable to get his Sauber going again after his stop, effecticely also ending his race, and Sauber's race altogether. While raindrops are spotted through turns 9 and 10, Vettel is clinging on to Rosberg while Alonso has closed to within a second of Ricciardo. Fuel stats show that Alonso has used less fuel so far, a fact that may leave Ricciardo vulnerable to fuel saving towards the end of the race. On lap 42 Ricciardo pits to change from hards to medium for his final stint. The crew released him through while the front left still was not fitted perfectly, requiring Ricciardo to stop halfway through the pitlane, only to be pulled back, get the wheel fitted properly and get going again. The Australian rejoined the track just behind Alonso, indicating he lost an entire lap. Another half a lap later, Ricciardo's front wing was seen hanging loose on the right, badly cutting the right front tyre as well. Ricciardo obviously returned to the pits for new tyres and a brand new front wing and nose. To make things worse, Ricciardo was additionally handed a 10 seconds stop and go penalty for the unsafe release. 6 laps from the end, Alonso gets past Hulkenberg to take 4th. The Force India did have better top speed, but a nice fight through turns 1 and 2 eventually allowed Alonso to get past. Raikkonen is less fortunate as he appears to be unable to get past Grosjean, trailing him for numerous laps already. At Williams, Massa is meanwhile ordered repeatedly to allow Bottas past. The Finn is running on hard tyres and appeared in better shape to take on Button just ahead. Sadly for him though, Massa had no intention at all to listen to his team and retained 7th place, keeping Bottas behind while being unable to fight with Button who finised 6th. Hamilton meanwhile won the race in a fairly simple way, leading from start to finish and holding a comfortable margin to his team mate during the entire 56 laps.